Does a Building’s Age Affect It’s Rent? Just as a spate of new housing units comes to market in New York City — the newborn sheen and amenities accompanied by premium rents — a study by the website RentHop offers a look at the relationship between a building’s age and the rents charged. Among newer buildings, it found, rents decreased as a building’s age increased. The drop was particularly obvious in Battery Park City, where the median-age building was constructed in 1998. Citywide, however, the median age of buildings is about 90 years, and in most older neighborhoods there was a more complicated relationship between the age of a building and the rent. Location, not surprisingly, often mattered more. And buildings with historic merit were also sometimes more expensive than newer buildings nearby, as were older buildings with elevators. Focusing on one-bedroom apartments in Manhattan, in buildings with elevators, RentHop produced a list of neighborhoods in which the greatest age-related discounts can be found. Who’s Buying a First Home? It’s never been easy for first-time buyers to get into the real estate market but that’s been especially true in recent years. In 2010 (or July 2009 to June 2010, to be precise), they bought half the homes sold nationally. In 2016 (or July 2015 to June 2016), only 35 percent went to first-timers. In only three of the last 35 years have they had a smaller share. So who are today’s first-time home buyers? To paint a picture of the typical first-timer, we drew information from the 2016 Profile of Home Buyers and Sellers, published annually by the National Association of Realtors. Among the myriad insights offered by the report was the revelation that 18 percent of the homes sold to first-timers went to single women, and just 8 percent to single men. Not surprisingly, considering the wage gap, the men were able to pay a bit more: The median home price paid by the men was $157,000, while the median price paid by the women was $146,300. Find some of Portland’s biggest 1-year price jumps on its edges: Hayden Island, East Columbia, Linnton, and far southwest. Where the kids are: University Park. Their elders make home in Maplewood and Hayden Island. The east side’s best location for public transit fans? Kerns is just the ticket. Dunthorpe (not officially a neighborhood, but starting this year we’re calling it one) fetched the city’s highest median home sale price—$1.192 million. Good things come in small packages? Buying downtown costs a steep $396 per square foot. In Sylvan-Highlands, median household income rose $20K in 2015—making this West Hills hood our wealthiest. The City’s median 2015 sale price—$340,000—has shot up 45 percent since 2011. Out-of-towners are flocking to downtown, but also to Northeast Portland’s Argay and Parkrose. Priced out of Portland’s rental market? Try Estacada. Gladstone homes are market stars, with a large price spike (nearly 20 percent). Since 2011, they’ve risen 51 percent. Cornelius: chock-full of young families. Get the most home for your dough in Troutdale. Low-density Sauvie Island lets you stretch your wings—for a price. McMinnville averages 61 days for home sales—slowest in the metro area. This morning I am presenting some new research that compares the 100 largest MSAs in the country at the Multifamily NW Apartment Report release. The work covers how cities face tradeoffs between economic strength, quality of life and housing affordability. A city can achieve success on two but not all three dimensions at the same time. This represents what I am calling the Housing Trilemma. In advance of releasing all the material, I want to first focus on just the affordability measures. When discussing Portland’s housing affordability, the most common way is to point out prices in other major West Coast metropolitan areas. For example, according to Census figures, Portland home values are 17% below Seattle, 39% below San Diego and 58% below San Francisco. Monthly rents show similar patterns, albeit with slightly smaller differences. So while many admit Portland’s prices are high, they’re still a bargain compared to these other locales. And this is certainly true, so far as it goes. 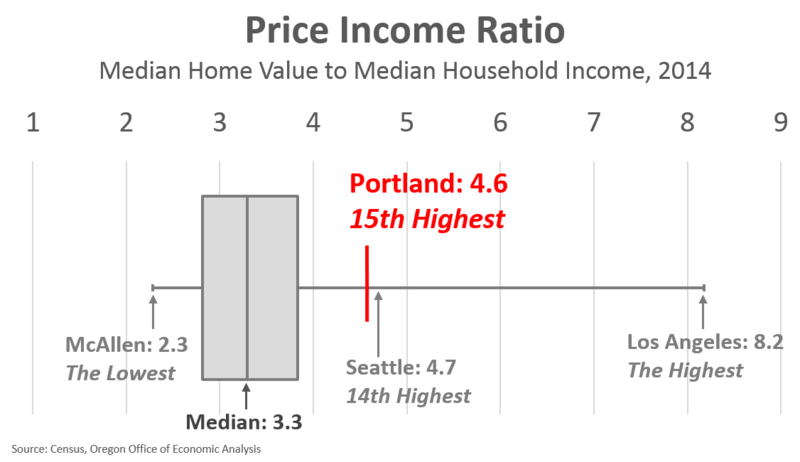 However, adjusting housing costs by local incomes, something I would argue is a better way to measure it, Portland’s affordability looks considerably lower. To help put Portland’s housing affordability in perspective, below I detail each of the three housing measures I used in the new research. A quick refresher on box plots, or box and whisker graphs. The box itself shows the middle 50% of all values. In this case it means the middle 50 MSAs, with 25 having lower values than the box and 25 having higher values. 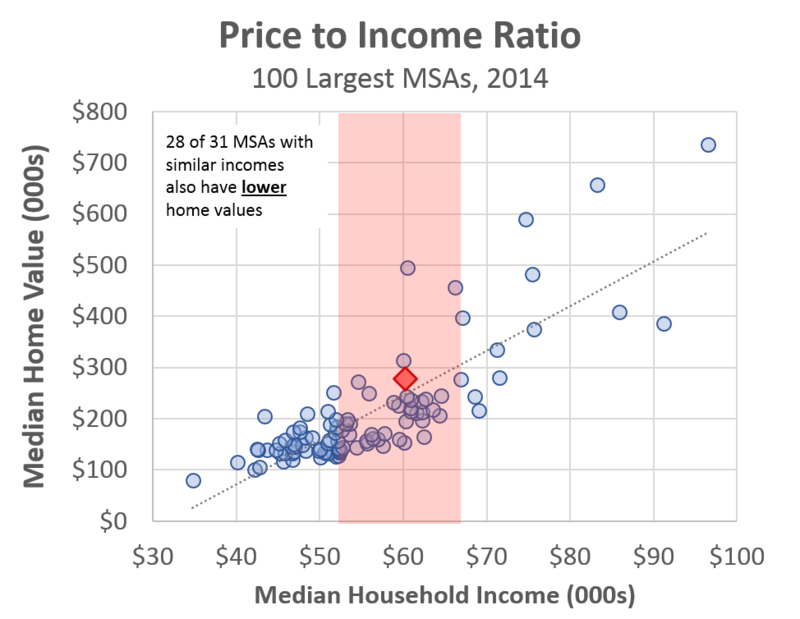 The middle line represents the median where half of the MSAs have higher values and half have lower values. The extended lines, or whiskers, show the minimum and maximum values across all 100 MSAs. The first metric tries to gauge and compare ownership affordability across metros. Specifically this is the ratio of median home value to median household income. The longstanding rule of thumb for affordability is roughly 3 to 1 ratio. The median across the nation’s largest metros is 3.3. However Portland ranks 15th highest (or 86th lowest), just a notch below our neighbor to the north. Portland is also considerably higher than the box part of the graph, or the middle 50 metros in the country. Going back to how we typically discuss affordability. Based on the Census figures, 13 MSAs have higher home values than Portland. 12 of those 13 also have higher household incomes. 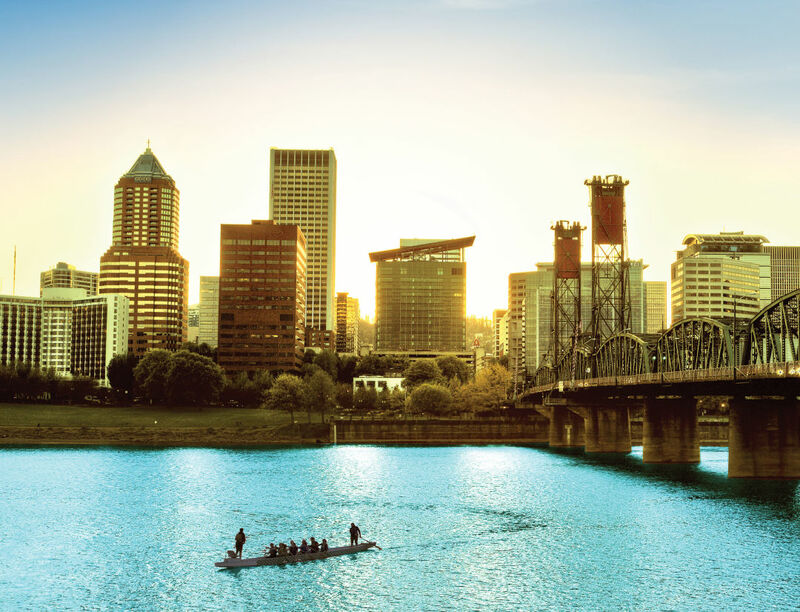 The 1 that does not – Sacramento – trails Portland by $200. However, comparing Portland to metros with similar income levels reveals a different pattern. 31 MSAs have median household incomes that are +/-10% of Portland’s income. 28 out of these 31 metros have lower home values than Portland. The second metric is the share of rental households that spend 30% of their income on rent, or more. This is the classic measure of being housing cost burdened. It is an imperfect measure, but is also fairly well understood and regularly used. If a household has to spend an outsized share of their income on housing, it leaves less money to pay for everything else. Here, Portland ranks 26th highest. That is, the share of rental households in Portland that spend at least 30% of their incomes on rent is higher than 74 of the 100 largest MSAs in the nation. The differences may not seem to be large, a couple percentage points, for example. However in practice this represents a lot of households. 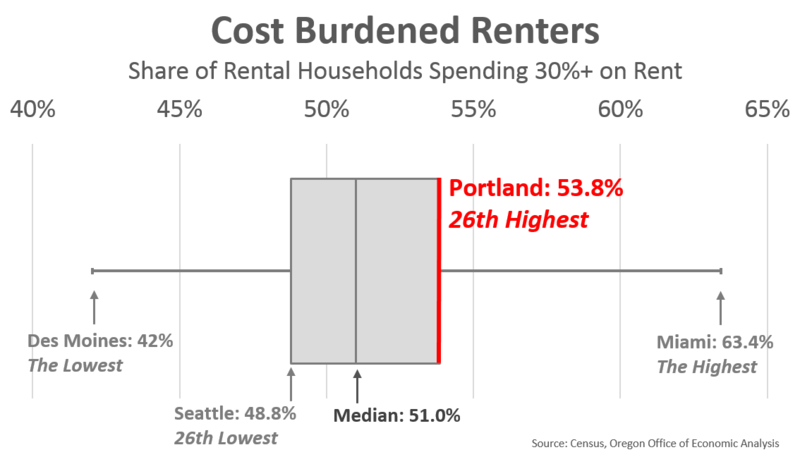 If, for whatever magical reason, Portland’s share dropped from its current rate to the median 51%, that would mean 10,000 fewer households that were cost burdened. Declining to Seattle’s percentage would mean 17,000 fewer households that were cost burdened. 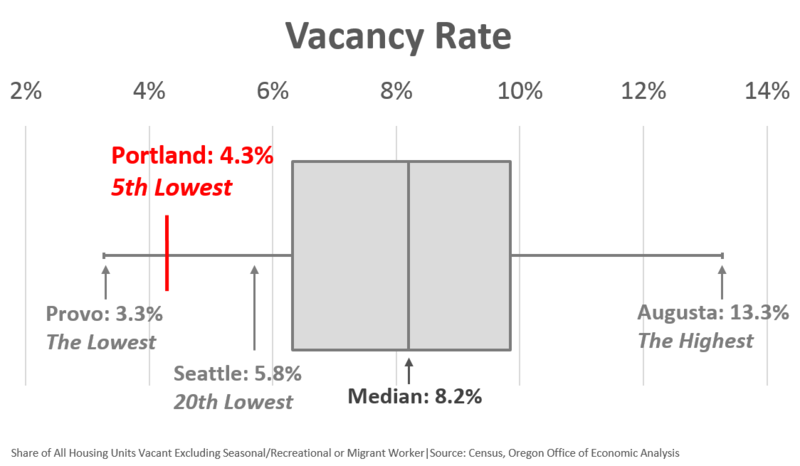 Portland’s vacancy rate – the share of housing units that are not occupied, after adjusting for second homes and migrant worker housing – is the 5th lowest in the nation. This encompasses both owner and rental properties. The low vacancy rate gets to the heart of the current market. There are too few units given the strong, and growing demand. In such a market, anything available at a remotely reasonable price and/or location, is gone instantaneously. The lack of supply drives prices higher, everything else equal. 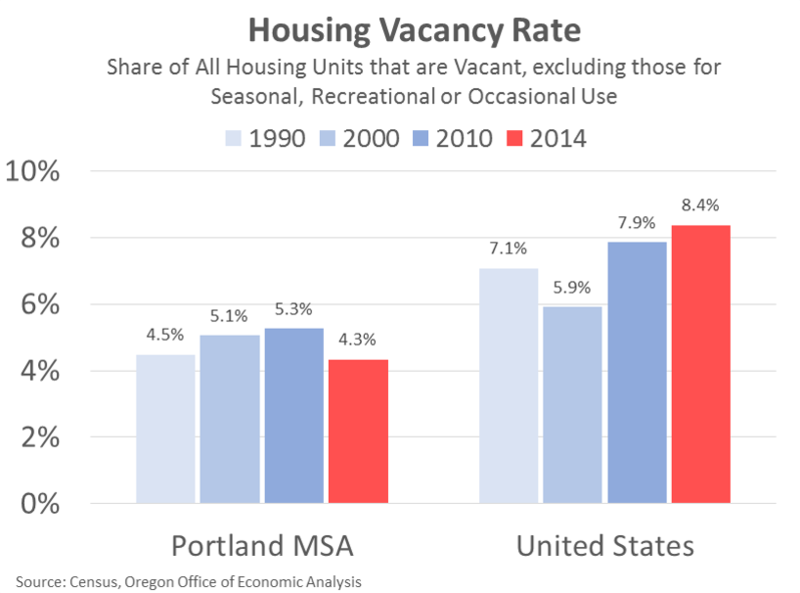 Now, Portland has always had a lower vacancy rate, however the issue is much more pressing today. The region is effectively one year behind in terms of new construction relative to the population gains. A couple years back, Trulia did some work examining vacancy rates across metros. Only 13 of the 100 largest saw their vacancy rates decline from 2000 to 2013. Portland was one of those 13. Nearly everywhere else saw increasing vacancies due to the housing bubble bursting and foreclosure crisis. Portland experienced those as well, of course, however vacancies quickly declined as the economy rebounded and household formation returned. Your mileage may vary on the specific measures used here. There are myriad alternates available. However, I think these three metrics do a good job of summarizing both housing affordability and comparing metropolitan areas across the country. The full Housing Trilemma work will be out soon, where you can pick any of the 100 MSAs and see how they compare across economic strength, quality of life and housing affordability. (NEW YORK) — Stocks closed at their highest level of the year Tuesday as investors welcomed the latest signal from the Federal Reserve that it will move slowly to raise interest rates. Big names including Apple and Microsoft led technology stocks higher as the market made its biggest gain in two weeks. Stocks rose after Yellen confirmed that the Fed isn’t in a hurry to raise interest rates. The Fed made similar points just two weeks ago, but since then, some members of the Fed’s decision making committee had said they thought it was time for rates to go higher. Yellen’s remarks boosted all corners of the market, and the price of gold rose along with stocks. Bond prices also rose and yields sank. The Dow Jones industrial average rose 97.72 points, or 0.6 percent, to 17,633.11. The Standard & Poor’s 500 index gained 17.96 points, or 0.9 percent, to 2,055.01 Aided by the gains in tech stocks and in small cap stocks, the Nasdaq composite index climbed 79.84 points, or 1.7 percent, to 4,846.62. Stocks were trading slightly lower before Yellen’s remarks, but they moved higher after the text of her comments was released. The price of gold climbed while bond yields fell and the dollar weakened. The yield on the 10-year U.S. Treasury note slid to 1.80 percent from 1.89 percent. The euro rose to $1.1295 from $1.1200. The dollar slipped to 112.75 yen from 113.28 yen. Gold rose $15.70, or 1.3 percent, to $1,235.80 an ounce. Apple climbed $2.51, or 2.4 percent, to $107.70 after the FBI dropped its legal efforts to force Apple to break into the iPhone used by Syed Farook, who along with his wife killed 14 people in San Bernadino, California, in December. The FBI said it was able to hack into the phone, and asked a court to vacate an order forcing Apple to help. Apple had been fighting the government’s efforts and said it will continue trying to make its products more secure. Microsoft added $1.17, or 2.2 percent, to $54.71. Information technology company SAIC advanced $5.33, or 11.5 percent, to $51.88 after its fourth-quarter profit was far larger than analysts expected. Utility and telecommunications stocks, which pay hefty dividends similar to bonds, also traded higher. Financial stocks made only small gains and lagged the market. They are able to charge more money on lending when interest rates are higher, so the Fed’s low-rate policy has hurt the sector. So has the weakening price of oil, because investors are worried that loans to energy companies won’t be repaid. Bank of America fell 20 cents, or 1.5 percent, to $13.42 and Wells Fargo lost 65 cents, or 1.3 percent, to $48.05. In her remarks to the Economic Club of New York, Yellen said the Fed expects to move slowly because the U.S. economy and financial conditions have weakened over the last few months, and global pressures could harm the U.S. economy. Those concerns include the possibility of a broad economic slump, lower oil prices, and the shaky stock market. The Fed cited similar reasons earlier this month, when it said it expected to raise rates twice this year, not four times. Benchmark U.S. crude dropped $1.11, or 2.8 percent, to $38.28 a barrel in New York. Brent crude, used to price international oils, lost $1.13, or 2.8 percent, to $39.14 a barrel in London. Home building companies rose after Lennar reported strong quarterly results, selling more homes at higher prices. Its stock gained $1.48, or 3.2 percent, to $48.18. Competitor D.R. Horton rose 90 cents, or 3 percent, to $30.72 and PulteGroup added 39 cents, or 2.2 percent, to $18.51. Drugmaker Medivation fell after a group of legislators took aim at the company over the price of its prostate cancer treatment Xtandi. They urged federal agencies to cut the price of Xtandi and asked for public hearings. Xtandi is Medivation’s only approved drug, and its average list price is about $129,000 a year. Sales topped $1 billion last year. Medivation stock shed $2.50, or 6.1 percent, to $38.75. Retailer Conn’s skidded $3.84, or 24.5 percent, to $11.81 after its quarterly profit came up short of estimates and its 2016 forecasts disappointed investors. In other commodities trading, heating oil fell two cents to $1.16 a gallon. Natural gas rose 3 percent to $1.90 per 1,000 cubic feet. Silver picked up 4 cents to $15.23 an ounce. Copper prices slumped 3 cents, or 1.4 percent, to $2.21 a pound. Overseas markets were mixed. France’s CAC 40 added 0.9 percent and Germany’s DAX picked up 0.4 percent. The FTSE 100 index of leading British shares was little changed. Japan’s benchmark Nikkei 225 lost 0.2 percent and South Korea’s Kospi added 0.6 percent. Hong Kong’s Hang Seng gained 0.1 percent. Prices of existing single family homes, as measured by the S&P / Case-Shiller National Home Price index, are rising in single digit terms. However, the price changes that matter – the real or inflation adjusted changes – may be higher than many suspect. Backing out inflation gives real increases averging 6.3% annually in 2012-2015. This compares to real increases of 6.8% annually during 1998-2005, the peak years of the housing boom. With two percent wage increases and one percent inflation, a real increase of 6% or more can make a difference. These numbers may offer one explanation for the recent popularity of apartments and renting. April brought stronger Portland-area home sales and a spike in prices, new numbers from the Regional Multiple Listing Service show. The listing service reported 2,734 homes sold in the Portland area in April, an increase of 27.6 percent from a year ago. If that sales rate continues, it would take less than two months to sell all 4,853 homes on the market at the end of the month. About six months of housing inventory is considered a balanced market, and the 1.8 month supply of homes suggests a strong seller's market. People seeking to buy a house in Portland faced longer odds in March than at any time since September 2005, the Regional Multiple Listing Service reported this week. The inventory of available houses dropped to 1.9 months in March, reflecting quickening demand as buyers prowl for properties and interest rates remain low. The median sales price jumped $5,000 in the month to $290,000. The trends are good news for sellers and real estate agents, who are scrambling to match buyers and properties, but bad news for buyers on limited budgets, who are seeing their prospects squeezed in the supply-demand curve. "There's hardly anything for sale, especially close-in, quality properties," said Jeff Parker, president of Parker Realty in Multnomah Village. "Properties are selling in the first two to three days if they're priced right." Parker said more buyers are offering all-cash deals. "Whether they're getting loans from their parents or grandparents, they've decided it's better to put their money in a house," Parker said. In its just-released March report, RMLS said there are 4,767 active listings in the Portland area. Closed sales and pending sales each jumped by about one-third from the previous March. The number of sales and prices are up in every geographical sector of the Portland area, but the hottest zone of all may be North Portland, where the average sale price of a house has risen 9.9 percent from a year earlier, and houses are on the market for just 35 days — the lowest level in the area. RMLS said North Portland had just 141 active listings in March, with a median sales price of $286,000, and an average sales price of $305,600.